It’s that time of year again! Time for me to head back home to the island I love so much, my original home, Penang, Malaysia. It’s been a running tradition for I would like to say 5+ years or so (basically when I could really afford to do it so regularly) for me to head back to Penang to see my family. This time around, we left a Wed and with the time change, will make it bright and early on New Years Day. This lounge is located in the international terminal of SFO behind the United lounge. If you’re walking through security, immediately make a right, pass the United lounge, head to the right some more, down a hallway and it’s to your left. It’s a little hidden, so just be on the lookout. Right when you walk in you’re greeted by a friendly SIA receptionist who checks you in. Taking a quick look around, we found a nice seat of chairs, by power adapters, plugged in our multiple devices then took a look around. Singapore Airlines SFO Lounge offers a variety of great eats such as this Singaporean Style Laksa (which basically means, it’s a coconut based broth) versus a Malaysian Assam style broth which is a clear broth made with fish. I loved how they even have a huge sign describing what it is for those who have never eaten laksa before. Overall I thought they did a really good job in terms of flavor. In the pre-made bowls you it comes with noodles, fried tofu, fish cake slices, large shrimp and egg. After you ladle a scoop of the delicious broth they give you the option of topping it with some fried slices of garlic and green onions. Other food the lounge that I didn’t actually get to try included what in Chinese we call, tau yu bak (or a soy sauce based pork dish with egg), a rice of some sort and one other dish I couldn’t quite tell what it was. Moving on to drinks there was a decent selection at the pour yourself bar and also in the fridge. One of the treats of the beverage selection was actually Hennessy Privilege which is actually not sold in the US at a lot of places and is MUCH smoother than regular Hennessy. I ended up just drinking that on the rocks and it was delicious. Of course they also had some beer choices as well including Tiger. For the approximately 12 hour flight we luckily had an empty middle seat so I was able to catch some zzzss. One of the things for me that really distinguishes Singapore airlines even for those flying in Economy is the fact that the personal entertainment system is so good. Also, there is a USB charger where you can charge devices like your phone and also a power outlet built into your seat. Even flying economy plus in United, anything to charge your phone is hard to come by! Here’s us getting ready to fly! Some meat with carbs on carbs and more carbs! Second meal consisted of fried rice with egg, shrimp and vegetables. Served with a waldorf salad (apples and other stuff), bread/butter and an apricot cheesecake. Overall tastiness: 1 was not too much of a fan of this dish. Rice needed more taste, hot sauce would have been great. When it comes to SIA food, normally I’ve had much better. Not sure if it’s because I normally fly through Hong Kong and this time I flew through Seoul but its definitely nothing to write home about. 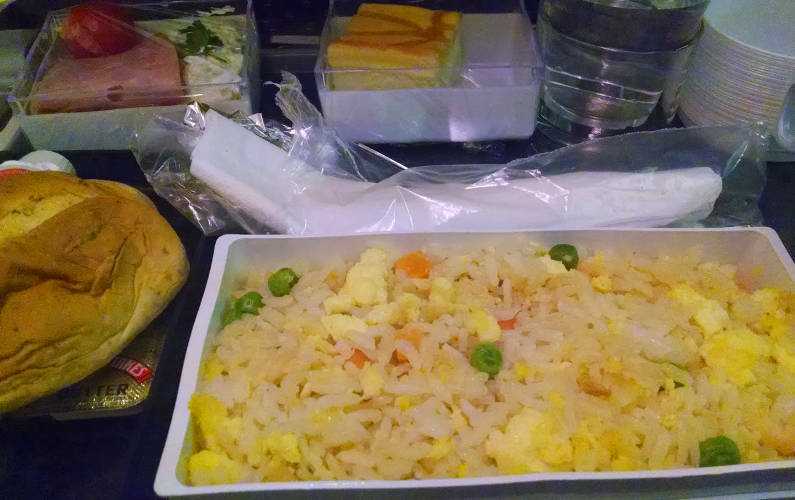 Good thing there’s yummy food to try in the lounges for us! 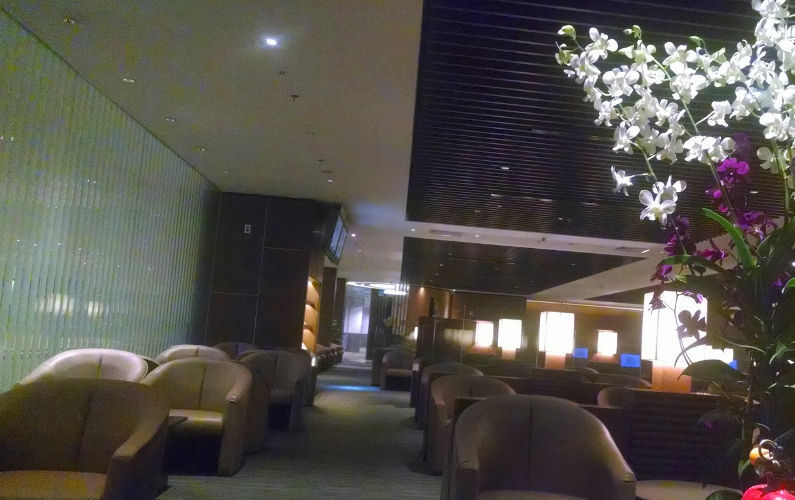 We had an hour stop over at Incheon while the plane switched staff before heading to Singapore so we had a chance to check out this lovely lounge. First thing we saw, free 15 minute facial! Score! I’ll definitely have to do that when we fly through Incheon in Seoul, Korea on the way back. But overall I thought the options offered at this lounge were great. Similar to the one in SFO they had some great hot food selections from pork bulgolgi, tofu and eggplant, lots of cold selections such as sandwiches, cheese, pastries, and so much more. The staff was also great, she let us know that our plane wasn’t actually going to be boarding yet (kept us informed) so we didn’t have to leave the lounge early only to wait in line and got to enjoy the amenities for a little longer. Looking forward to the opportunity to spend more time here on the way back! One totally random note, this lounge restroom is so nice, even the toilet paper is scented (so that you don’t give me an odd look like my BFF did when I told him, I had to blow my nose!). Having done this route multiple times, I am very used to having to spend 4+ hours at least laying over in Singapore before actually making it back to Penang. This time around, we had an opportunity to check out the lounge in both T3 (where we flew in) and T2 (where our next flight was taking off from). WTH Singapore Airlines, for this being your home airport, both lounges are really disappointing. As you read in my other lounge reviews above, both had showers, unfortunately neither lounges for Star Alliance Gold had showers (big minus). Also, the bathrooms are regular public restrooms outside the lounge! Much more spacious and open than the T2 lounge. It’s located on the second floor near the Ambassador Hotel and Lounge. This one actually hand an outside sitting area and hot food being served even when we came in around 1am. The big minus was that it was super humid in T3. The staff was also much friendlier than the one in T2. Completely empty both of people and food when we came in. The front check in lady also gave us a bit of trouble since we were going on a SilkAir flight despite the fact that we were from a Singapore Airlines flight and we booked the whole ticket through SIA. Though apparently SilkAir is not Star Alliance she had to get approval (something the lovely lady in T3 didn’t do). Food was ultimately available a bit in this lounge around 5am. They also have nice old school instrumental music, very soothing. At Incheon, even doing a transfer, you’ll have to go through security again and their xray machines are way more intense than the ones in the US so be sure to not carry any liquids whatsoever, they’ll definitely spot it. At Changi, if you know that you’ll be spending some time here, make a reservation at the Ambassador Transit Hotel. It usually gets booked so once you know your dates of travel, make a reservation. I’ve stayed here before (not this time) and it offers a comfortable bed in a private room and shower facilities. Good if you want a place to actually sleep comfortably. Where do you love traveling to?